FREDERICA, Del. — Once again, the clunkily titled but well managed DE Turf Sports Complex provided all the ingredients for an exciting weekend of Mid-Atlantic bid-hunting. On Saturday, the turf baked at around 80℉, with the heat only occasionally broken by a jittery crosswind, and the favorites across divisions swept up: the ten top seeds each won their pool handily. But when the fields rapidly cooled under a torrid Sunday rain, results started to get squally, too. For all the Saturday grumbles about field material, Sunday’s swamp surrounding the fields demonstrated turf’s prime advantage over grass: no flooding. With wild results in Mixed and a game-to-go for the ages in the Men’s Division, the up-and-down spectacle proved well worth suffering through some weather. Verily, we all did muse: would history repeat itself in 2018? Would Temper crumble on the doorstep once again? Twice? After all four pools went chalk (save No. 11 seed Garden State’s H2H point-differential “upset” over No. 5 Richmond Floodwall), the stage was set. On Saturday evening, top-seeded Temper ran away 15-4 against No. 4 Baltimore Medicine Men in one semifinal; both teams then came over to watch #6 Washington DC Truck Stop finish off #19 Philadelphia Patrol 15-7 in the other semi. It was Truck Stop’s closest game of the weekend. The two victories set up a rematch of last year’s Regional final, which Truck took 15-13. Come midday Sunday, as the rest of the region slogged through the muddled backdoor bracket, Truck Stop arrived early for the afternoon final to find #12 Pittsburgh Temper, determined to prove their seeding was no fluke, setting up their already-waterlogged sideline tents. Any home-turf advantage Pittsburgh may have tried to stake out, however, was foiled by DC’s dogged dump defense and indomitable deep game, forcing Max Thorne and Pat Earles into tough resets and tougher skyballs. Temper across the board looked uncomfortable in the slippery conditions, missing Michael Ing due to a knee injury, and Truck’s D-line feasted on every turn. David Cranston helped marshal along the slew of breaks, often finding Delrico Johnson in the end zone with several comfortable steps on his matchup. After taking half 8-5, DC turned the jets all the way up; Pittsburgh only scored one more point in the game, not garnering a single break, to fall 15-6. Truck’s O-line was not broken a single time the entire weekend. Temper didn’t completely pull their starters in the second half of the final, but it was clear by halftime that their thoughts had turned to the game-to-go. Truck Stop celebrated, once again, a set of matching Regional championships with Scandal. A flustered Temper, leery of history, dropped into the second place bracket. Patrol, once again, awaited them there, having avenged their brethren Citywide’s contentious hard-capped 14-13 loss to Med Men with a 14-13 victory semifinal over the boys from Baltimore themselves. Destiny seemed to be winking cruelly at Pittsburgh. As the game-to-go kicked off, the rain worsened and with it went Temper’s luck: Patrol received and held to start, then broke twice to put Temper in a quick 3-0 hole. Temper recovered with a few good hucks, but Patrol maintained their intensity through several long points and carried the lead into half, 8-5. After both teams took turns warming up at the same bathroom’s hand dryers, Temper held out of the intermission, then turned a turfed Patrol swing into a deep shot to Sam VanDusen for the break. Suddenly, Pittsburgh had new life. After trading holds, Temper capitalized on a drop by Philly and found Andrew Kohl in the endzone to tie things up at 9-9. Temper’s cheers rang so hoarse they sounded like howls. The next eight points, save the odd pair of offsetting turns, were all typical holds: Patrol swung until David Baer had power position and Connor Russell had a step deep; Jonah Wisch got the upline strike from Mark Fedorenko and dished it to Max Thorne. Neither team would take their foot off the pedal. Tied at 13-13 in a game to 14, Patrol centered the pull but sent a routine swing to the turf. Picking up the disc and wiping off the gravel pellets on his shirt, Thomas Edmonds then stepped out with a smooth backhand to find Fedorenko for the game. Temper’s quickest break, just their third of the day, was the longest one coming. It was their only lead on Sunday, but there couldn’t have been a better moment for it. After losing five consecutive games-to-go dating back to 2015, Temper had qualified for Nationals. Tears overflowed on both sides. 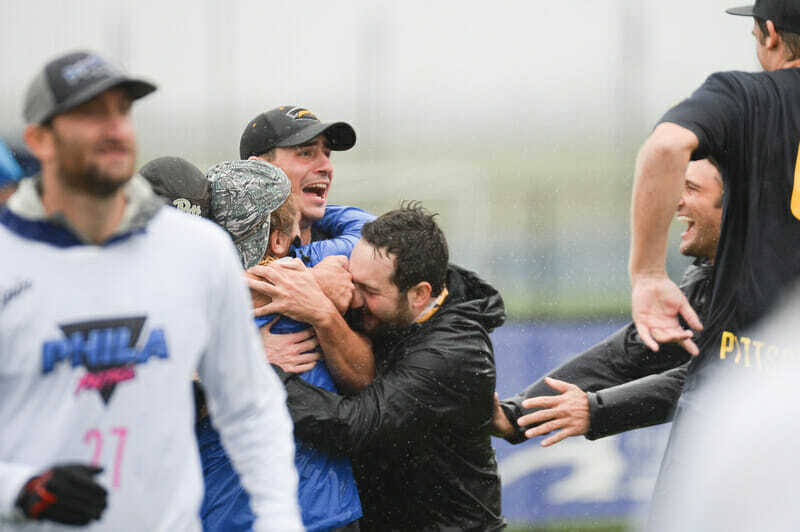 As the rain slowed at last, and the Temper sideline swarmed the field in elation, the pro-Pittsburgh crowd celebrated with fruit salad and beer. Top seeded #3 Philadelphia AMP came out poised and crisp and never looked back on their return trip to Nationals. Anna Thompson was back in the lineup, healthy. Linda Morse frequently worked from the handler set, trading swings with Nicky Spiva; both integrated nicely into an offensive unit that scored at will the entire weekend. Kelsey Bova and Richard Robinson got key blocks on a D-line that seemed immune to the same rain-induced miscues that, under fierce and fresh defensive pressure, assured their opponents’ defeat. The reigning Regional champs, having beaten all comers by 5+ points per game, rolled back into the final after securing their earned bid over no. 4 seed West Chester Loco 15-3 in the semis. AMP awaited the other automatic bid-winner to emerge victorious from the Washington DC Space Heater/Pittsburgh Alloy showdown. If you’d been following the @Ultiworldlive feed through the first half, you might’ve assumed that would be a similar blowout, though not as seeding would’ve dictated. No. 3 Alloy was dominating No. 2 Space Heater. Pittsburgh’s defenders seemed to have cracked DC’s flow, regularly jumping the lane for prescient poach blocks or baiting deep looks then punching in their own fast breaks. Jenny Fey and Zach Norrbom‘s usual rhythm stuttered in the weather, and Space Heater’s star-studded roster looked fallible for the first time in the tournament. 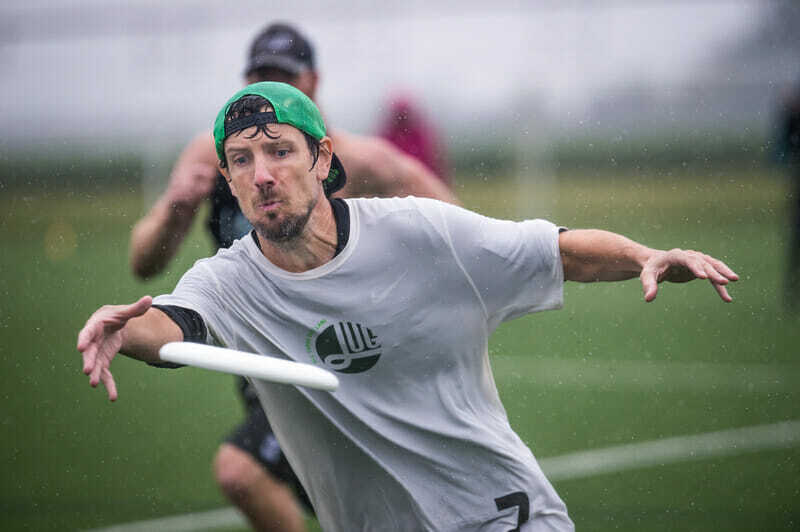 Pittsburgh’s Owen Watt roamed the deep space, skying DC’s Kyle Khalifa on a full-field huck for an emphatic break at 5-2. Khalifa got handblocked at the brick mark three points later by Aaron Kane, allowing Alloy to set up the endzone vertical: a quick dish from Justin Forman to Darra Reppermund took Pittsburgh to a crushing halftime lead of 8-2. This reporter left to check out Garden State’s game against Patrol in the men’s backdoor semifinal where GSU, hungry for another upset, was up a break early, 7-5. After Patrol stormed back to take half 8-7, I returned to the mixed fields, expecting both blowout games to be finishing up, and was surprised to find Space Heater in the midst of their own storming out of half, matching Alloy’s first-half six breaks to knot things up at 11, game to 13. Needing to go on an 8-2 run of their own seemed to revitalize Space Heater, as DC’s veteran mettle bloomed under pressure. Alan Kolick picked up a run-through catch block on one point’s second throw for a quick break; Fey found Claire Desmond streaking deep to hold. Sandy Jorgenson picked up two endzone swat-blocks in the same point. Pat Shriwise added one of his own, and some sixty-odd yards later Kolick found Georgia Bosscher at the front cone for a seventh break and Space Heater’s first lead of the game. Now down 12-11, Pittsburgh received, looking to right the ship and take things to double game point. But one errant swing gave DC the only chance they needed to punch in their eighth and final break for the game and the second strength bid. More than their waltz through pool play, the #gritandgrace of this epic comeback should solidify Space Heater’s spook value heading to San Diego: who knows what their Nationals ceiling could be? AMP took them down a peg, though, with a 13-9 win in the Regional final. Both teams had claimed bids, sure, but there were bragging rights — and seeding implications — on the line. AMP’s win avenged an early season loss to Space Heater that helped secure a third bid for the Mid-Atlantic and set club ultimate ablaze with intrigue around the new team. Falling into the backdoor bracket, Alloy’s troubles continued against seventh seed New Jersey Jughandle, another team who’d lost only to AMP and Space Heater so far on the weekend. Pittsburgh came out a little slow, perhaps still stunned after their collapse in the prior semifinals, and New Jersey’s D-line, led by Ryan Anderson and Jessica Wolf, capitalized on a series of miscues to take a 10-7 lead. Alloy found a late game gear to take it to DGP at 11s, but Jughandle showed no fear in putting up a trust huck immediately to Harrison Treegoob, who brought the pull play down in traffic well within the endzone. Alloy’s spirits evaporated with their bid hopes; Jug celebrated, ecstatically cheering “No left turns! No left turns!” They were the first New Jersey team to reach a mixed Regional final since Termite’s Entourage fell to AMP back in 2011. Resting on their laurels just briefly, Jug showed up to the game-to-go mentally fueled by what coach Judy Jarvis calls “joyfire,” which I imagine tastes like phlogiston mixed with moonshine. When asked about how the team kept spirits up despite the Sunday downpour, Jarvis said she “actually asked the team not to talk about it [the weather] aloud,” to literally keep the rain off their minds and their minds on the games. “We noted [the rain] for throws and zone looks, sure, but we spent no time wallowing in it,” she said. Against a tired and injured Loco, this mental edge would prove the difference. Princeton took half 8-5, and, though West Chester tied it up at 9s thanks to standout play from Ken Wells and Beata Szekeres, Jughandle maintained their lead on serve into the soft cap: 13-12, game to 14. Loco, gunning to force universe, worked the disc smoothly past midfield into the red zone, churning yards in a tight horizontal scheme, but a misfire in the handler rotation gave Jughandle the disc near the sideline. Without hesitation, up went a full-length crossfield backhand huck to find a streaking Treegoob, for the break, the win, and Loco’s strength bid. After arguably the biggest upset of Regionals weekend, Jughandle was going to Natties. Treegoob’s curly locks bobbed furiously as he ran toward his sideline, Jug raucous, and I wondered: how did Jughandle pull this off? Would their turnpike witchcraft even work on the West Coast freeways? Most importantly, how could his hair stay so luscious in the rain? Maybe it’s that joyfire stuff; maybe it’s their matching team tattoos. Whatever the secret, look for Jughandle to keep the engine running hot as they ride into Nationals. From Saturday morning down to the final, Washington DC’s top two teams showed their seeding was no fluke. No. 1 seed Scandal and no. 2 seed Grit each torched their respective pools, which went to chalk across the lower matchups as well. Grit’s opponents scored 14 points in total on Saturday; Scandal allowed half that number, actually blanking two other teams en route to the bracket. Bracket play saw the top four seeds–Scandal, Grit, VA Rebellion, and Pittsburgh Hot Metal–advancing from the quarterfinal round by wide margins (save Hot Metal’s 10-8 point-capped victory over Philadelphia Green Means Go). The wind picked up as the semifinals kicked off, adding an extra meteorological wrinkle to the drizzle and encouraging some more junky defensive schemes. Grit took care of Rebellion 15-6 while Scandal cruised 15-3 over Hot Metal. The all-DC championship took place with the rain flying nearly parallel to the ground. #5 Washington DC Scandal relied on their experienced handler sets to work methodically through #15 Washington DC Grit‘s cup, while their own zone neutralized Grit’s speedy cutters and exploited an offense without throwing depth. 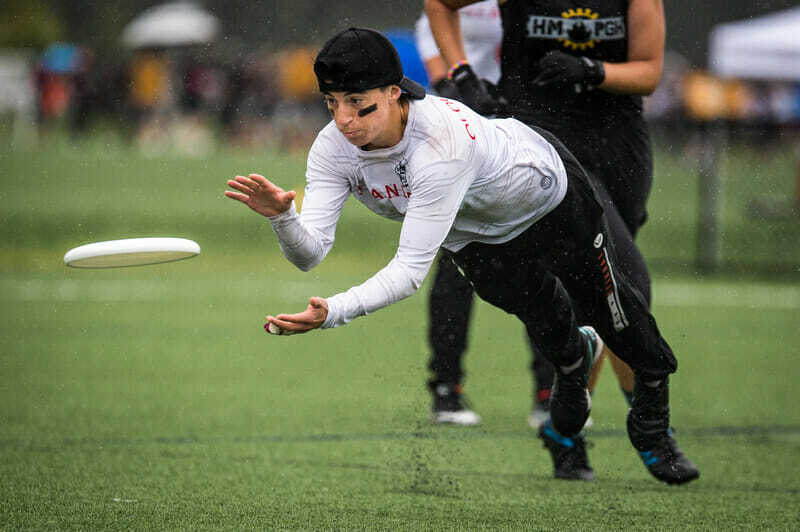 Scandal’s defense keyed in on the point of attack, and sticky handler covers kept the disc out of the hands of the few Grit players capable of shaping throws in the wind and rain, leading to easy blocks for defenders downfield. Grit managed to put up eight points against their hometown rivals, twice as many any other team managed against Scandal, but the final result was rarely in doubt. While Grit’s depth issues were exposed, Scandal’s strength in numbers showed through. Sure, there were individual standouts: Keila Strick dominated her matchups all weekend, Lisa Kowalski paced the D-line off the turn, and Laurel Oldershaw anchored the defense despite what seemed to be a broken finger. But the potent permutations of seasoned vets and young guns that Scandal can send out, line after line, continue to set them apart from their regional competition. Scandal’s system forced turns with the same relentless force as the rain. The downpour swamped Grit, just as it did everyone else in the region. Comments on "Mid-Atlantic Regionals 2018 Recap: Temper Breaks The Curse, Jughandle Heads Right Into Nationals"